A Shade Canopy is the Perfect Shade Solution! Perth is a definitely a beautiful city, but the weather can be a bit temperamental. Perth does receive plenty of rainfall during the year making it the fourth wettest city in Australia, but summers here can be extremely hot and dry. With all that rain and sun throughout the year, enjoying the outdoors or leaving your vehicle outside can be problematic. Let’s face it, if you want to rid yourself of that problem, then ordering a shade canopy is certainly the best solution. I’ve been providing shade canopies in Perth, and the rest of the country, for over 25 year’s and in my experience, shade canopies are one of the most cost-effective shading solutions available in the market. Not do they provide more than adequate protection from the sun or rain, they also add personality to a building. Don’t just take my word for it though; below I’ll highlight some of their benefits so you can decide for yourself. Because shade canopies are available in a wide variety of designs, colours and sizes, they’re perfect for any location. Many establishments in Perth use canopies to cover parking areas. Restaurants install canopies over outdoor dining areas. Recreational centres, hotels and resorts use them to cover outdoor pools. They are even popular in homes that have large backyards. One of the best features of a shade canopy is that it can be permanent or temporary. 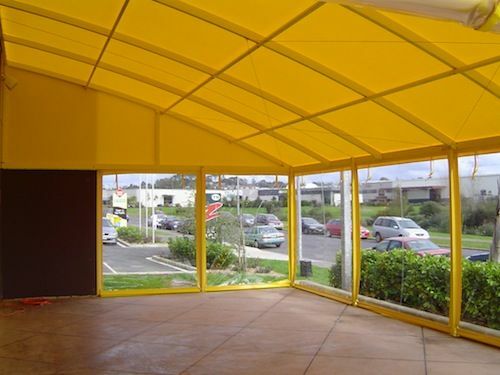 Permanent shade canopies usually come with a metal frame that is strong enough to withstand the elements. Temporary structures come with a lightweight frame that can be dismantled so the canopy can be moved elsewhere. One of the reasons why a shade canopy is the perfect solution is because it can be customised. Shade canopies can be large or small depending on the exact area where they’re needed, and aesthetically, they can be manufactured in a wide variety of fabrics and colours to suit your requirements. But perhaps best of all, the shade canopies we offer to Perth customers are available with accessories, such as drainage, PVC blinds (outdoor blinds), Cafe blinds, electrical outlets or heating options, which makes them a truly flexible solution. In your search for a shade canopy in Perth, you may have considered that canopies might not be able to withstand the strong winds that can often hit the city. Our permanent shade canopies are designed to withstand rough weather conditions. Even if the structure was designed with lightweight steel, don’t be fooled because it can match the toughness of other permanent shading structures. Another reason why commercial establishments may require a shade canopy is to promote their brand. As mention, they can be customised to the colour of your choice, ideally to match the companies branding, and more so, establishments can have the logo and/or slogan printed on it. You might notice this to be popular with restaurants that offer outdoor dining. With all the advantages of a shade canopy, it’s difficult to think why it wouldn’t be a perfect solution. They’re perfect for commercial establishments and homes. They are structurally sound and customisable. In fact, you can create your own design and have it printed on the fabric. So, if you’re looking for a canopy in Perth, make sure that you buy the best. Global Shades has been manufacturing shading products for quite a long time so we know exactly what customers need. If you need further information, simply call one of our friendly representatives or visit our offices to discuss your requirements or to obtain answers for any of your concerns.